6 Species of Trees That Will Complement Your Front Yard | Mr. Tree, Inc. Ask 10 tree lovers what exactly they love so much about trees and you’ll get 10 different answers. After all, there’s quite a lot to love; trees give us shade, oxygen, fruit, a home for beneficial animals, privacy, and a hundred other benefits that we could spend article after article expounding upon. Planting a tree or trees on your property is one of the best things you can do to boost the curb appeal of your home while giving your children a great place to play and yourself a wonderful spot to relax and reflect under. So, the question isn’t should you get a tree for your front yard; the question is only, what are the best kinds of trees to plant in your front yard? The answer to that is, of course, it depends. Magnolia trees are native to the United States, appearing naturally from North Carolina to Texas. The Southern Magnolia is the state flower of both Mississippi and Louisiana, but it also happens to grow great in Oregon. The flowers are the most striking feature of this famous tree, so if you’re looking for something that’s a little showy during springtime, look no further. The Southern Magnolia will ornament your front yard with its big, bright white flowers starting in May, but it retains its beauty year round as it will turn beautiful, vibrant fall colors during the autumn. This tree is a hardy one, able to grow in up to Zone 7 and it thrives in full sunlight, with no shade. Any breed of cherry tree can be an amazing choice for your front yard, but since we had to narrow it down to six for this article, we chose birchbark as our favorite. Cherry trees, of course, are renowned for their gorgeous flowers, but the birchbark tree will also wow you with the deep red-brown color of its bark. This is another hardy tree, surviving in up to Zone 6, and it can also handle full sunlight. Most tree fans are lovers of nature in general, and when looking for trees to plant in the front yard, hope to find something that will be attractive to birds and other wildlife. If you’re looking to turn your yard into a haven for local wildlife, consider planting a native tree. The fruit will bring in local birds and squirrels who are already accustomed to eating it, and it will of course take to the climate and conditions naturally. While there are many great native trees to choose from in the state of Oregon, one of our favorites happens to be the Western Crabapple. The only crabapple native to the West Coast, this particular tree is great if you’re looking for something on the small side. It tops out at about 35 feet in height and features a distinctly oblong shaped fruit that local species of birds love. It is a versatile tree, growing in hardiness Zones 3-8 and it prefers sun but can adapt to partial shade. Starting in May, the Western Crabapple will produce clusters of small white or pink flowers, beautifying your home while also drawing in beneficial insects that naturally protect the tree from pest species. So far, we’ve mentioned a couple of flowering trees that will look gorgeous in the spring and change to a rich color for the autumn, but how about a good, old fashioned, evergreen tree? Another one of our favorite types of tree, the spruce is incredibly popular in homes around the world at Christmas time, but can give your home the extra curb appeal it needs throughout the entire year. Of course, the term spruce refers to an incredibly broad genus of tree with nearly 40 different species encompassed under it; we promised this article would only have six tree species, so we’ve had to pick our favorite. In Oregon, that means the Norway Spruce, which as its name suggests, is native to the colder parts of Europe. Since it’s genetically adapted to survive the frigid winters of Norway, it has no problem dealing with the chill of Oregon’s colder season. Its strong branches can stand up to blizzards and heavy winds better than some of its cousins. The Norway Spruce is a small tree that grows fairly rapidly, reaching its full height of about ten feet in just about ten years. It does best in hardiness Zone 3 and prefers full sunlight. You’d be hard-pressed to find a tree that’s more attractive during the hot Oregon summers than the Crape Myrtle. While most trees start losing flowers as spring comes to an end, Crape Myrtles are just getting started. Their flowers come in a dazzling array of colors, including purple, pink, and white, and will last throughout the summer. As summer comes to an end, the Crape Myrtle will awe onlookers with gorgeous red and golden leaves that will appear through the fall and finally drop off by wintertime. Even without its leaves, though, the Crape Myrtle continues to impress with its beauty as even its bark has unusual patterns that develop throughout the winter. This tree is a versatile type and can be found in small varieties, growing as little as 5 feet or as tall as 25 feet. This is another tree that thrives in full sunlight and can grow in up to hardiness Zone 6. We mentioned a lot of trees that prefer full sunlight, but here’s a gorgeous one that does well in shade. 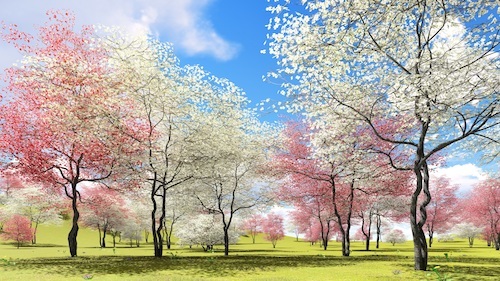 The flowering dogwood tree is one of the most impressive trees out there, visually speaking, as its red branches and colorful flowers are legendary across the Southern United States. This tree is another one native to the U.S. and as such, it’s great for attracting birds and other wildlife. It usually attains a maximum height of about 15 feet, prefers shade with a little sun, and hardiness Zone 4. Of course, we’ve only mentioned six trees and there are many more beautiful trees that can thrive on your property, whatever your shade and soil conditions may be. For more information on what trees to plant in your front yard, contact your local tree service and ask for advice. They can also help you plant the tree once you’ve chosen it, and care for it for years after!